The Creative D100 goes beyond the bounds of regular iPod docks, losing the wire and allowing music streamed via Bluetooth from your mobile phone, notebook computer, iPhone or iPad. The D100 will work pair and play music from devices placed up to 10 metres away, working off either the power point, or 4 x AA batteries, so it can go wherever you go. 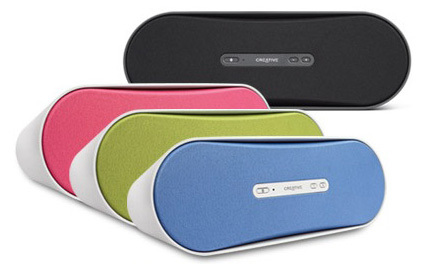 Logitech claim the D100 will play up to 25 hours worth of music on a full charge of the AA batteries. And if the Bluetooth lets you down for any reason at all, there’s a AUX-in port to give you a wired option to connect your device to the Creative D100. The Creative D100 is available now, in either black, pink, green or blue, at an RRP of $119.95. Previous ArticleAlien Anthology Limited Edition competition closing soon! Next ArticleGoogle Nexus S might make it to Australia. Sometime.